Are you looking for reliable, fresh, and tasty Denver catering services? Then you’ve come to the right place. Etai’s Catering has been your home for the very best in fresh, local catering since 1994. From serving up convenient and delicious box lunches to offices in LoDo, to providing healthy and tasteful salads and sandwiches for special events all across Denver, we are here to help you every step of the way. But when it comes to ordering catering services, sometimes it can be an overwhelming process. That is, if you don’t know how it works. Etai’s Catering aims to make the process as easy as possible — from the time you first glance at our catering menu, to the moment when you place your order, all the way through delivering the food to your event, we’re here to help. It’s fresh, it’s healthy, it’s Etai’s — keep reading to learn more about our catering process and place an order today! Every event has to start somewhere. Before you can begin planning your catering options, you have to first know the basic details, such as: when your event will take place, where it will take place, who will be attending, and how many people will be attending. Once you have these details plotted and planned, it’s time to nail down some of the specifics. No event could really be complete without tasty, fresh food. That’s what you should be looking for when the time comes to choose a company to provide catering services for your event. At Etai’s, we only offer fresh, delicious, and healthy catering options for special events like corporate lunches, weddings, funerals, and more. Once you’ve decided on Etai’s, it’s time to move on to the next step: the menu. What type of event are you going to be hosting? Knowing the audience can help make this step slightly easier. If your event is going to be held in the morning, you may want to opt for breakfast catering. If it’s more of a corporate lunch for on-the-go business people, you would be well-served to consider our catered box lunches. No matter the event, we have the catering options for you. Take a look at our Denver catering menu to find something tasty. 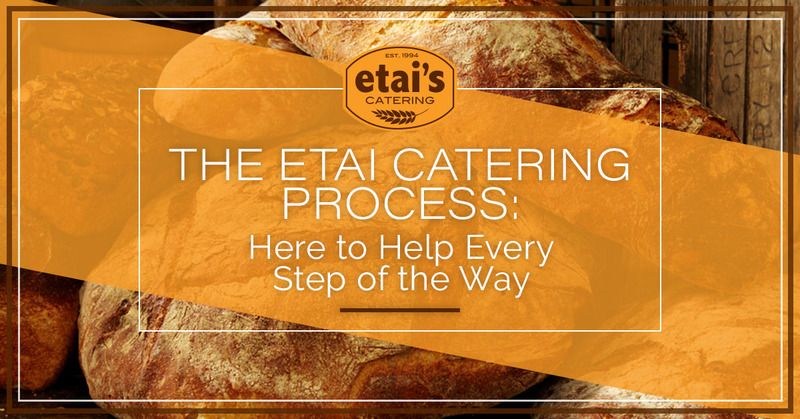 At Etai’s Catering, ordering is a simple and convenient process. Whether you want to give us a call for help with planning the specifics, or you want to save time and order online, we can accommodate you! Etai’s Catering wants to cater your next event! Place an order online or give us a call today to get our convenient, fresh, and tasty Denver catering services delivered straight to you.